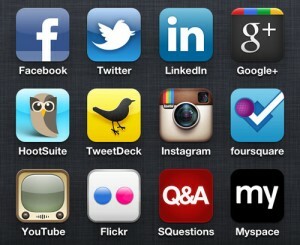 2) You can always discover a new way to use the social media tools you’ve been using for years. You just need the courage to dive in. Going from writing a Master’s thesis on using Facebook advantageously as a teaching tool in higher education to being the newest member here at Juicy Results and constantly using Facebook for marketing rather than teaching, the above statements could never be more obvious. Spending about a year of my life researching and studying the ins and outs of Facebook and other social network sites (as well as using them socially, myself) I thought I knew pretty much everything there is to know. That may have been fairly true when talking about understanding my own niche of their use, but then I got to Juicy and realized how much more there is to learn. Instead of using Facebook as an online meeting place for students, I’m now using it to post business content or connect with other small businesses. Instead of posting what I had for lunch on Twitter (just kidding, I never did that), I’m sharing news stories and updates with like minded people. What I’ve realized is that as long as I’m open to learning and using new tools and new social media, I’ll cruise along just fine. Like many situations in life, there are people who embrace change and others who resist it with all their might. Before I came to Juicy you could probably find me sitting in the middle of both of those groups. I think I liked adapting but not adopting. I loved changes that Facebook made, but hated even thinking of joining Twitter. I could handle the sites changing that I already used, but I didn’t like to get involved in new ones unless I was in before it became popular. I’m sure many of you out there have your online comfort zones like I did and really resist taking a step outside of that zone, but once you take the time to learn new tools like Hootsuite for scheduling posts or even Google calendar to share a schedule with friends and have that “Ohhh, this is why people use this” moment, you begin to let that new tool or site join your comfort zone as well. And, look at that! You’re a pro! I especially see this now that I’m concentrating more on the marketing side of things. Some businesses are very open to using social media, and others still seem wary. So far, I see MUCH more good than bad come from using social media for business, and learning how to deal with any new site only takes an open mind and a little bit of time to play around with what the site has to offer. May I just suggest, if you’re eager to grab on to anything new shown to you, stay that way. And if you’re the one tip-toeing around the idea, maybe just do some research and you’ll be surprised where you end up. Elise is our newest Juicer and Internet Marketing Assistant. We’ve been cramming her head full of more social media information than anyone should be exposed to in two weeks. This is her first of many blog posts. Love it! I can’t wait to read more Juicy posts by you, Elise! Great job! You hit the nail right on the head. Looking forward to more.